Belt buckle measures approximately 2-3/4" long, 3-3/4" at widest point, will fit a belt that is up to 1-1/2" wide and weighs 98 grams. An offer like this will not last long! 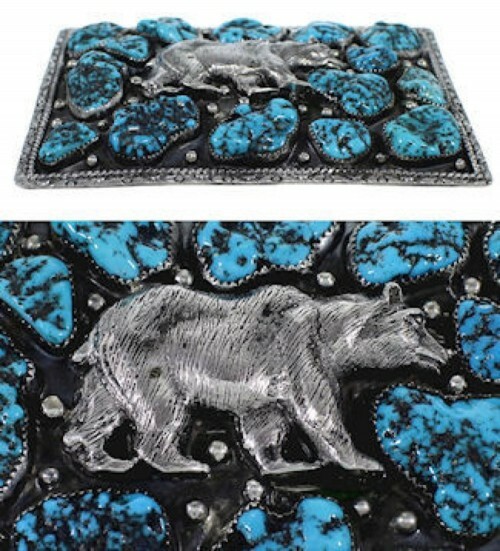 This is a gorgeous piece of jewelry that is crafted out of genuine sterling silver and real Turquoise stones. The belt buckle has a total of FIFTEEN stones that are delicately set in silver bezel, while silver beads, twisted silver, stamped patterns and an imprinted bear design can be seen highlighting for a remarkable finish. In some Native American beliefs, the bear symbolizes physical strength, leadership and is known as the "first helper. Belt buckle is stamped sterling and hallmarked.